In 2005, O’Hare International Airport began a project to relocate and modernize a 2.1 million ft.2 runway. 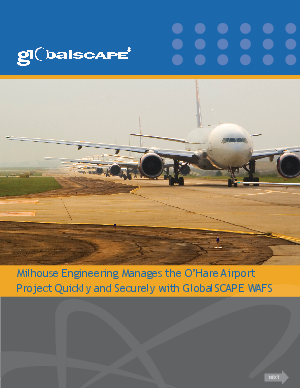 Five independent firms worked on the project design with the IT/data management led by Milhouse Engineering and Construction, Inc. Milhouse implemented GlobalSCAPE WAFS which mirrors critical files to all sites. This provided fast local access to all project files automatically without any administrative burden and with no delays.